ADVANCED MOD MEDIA™ CARTRIDGES FILTER PARTICLES 3 TIMES FINER THAN SAND FOR CRYSTAL CLEAR WATER! Sta-Rite® has combined the powerful filtering capabilities of a cartridge filter with the low-maintenance of a sand filter. Specially designed Mod Media™ cartridges will filter particles 3 times smaller than sand and require only a simple cleaning about 2 times per season. Now you can have the low maintenance of sand with the outstanding water clarity of a cartridge filter. This system comes with a high-tech tank that is compact and built of tough Dura-Glas® composite to withstand weather and corrosion. It is backed by a 1-Year Warranty. 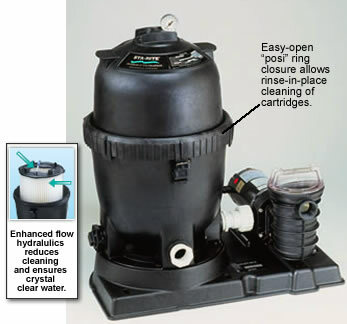 The tank is also designed around easy access with its easy-open “posi” ring closure that allows rinse-in-place cleaning of the Mod Media™ cartridges. You can wash and rinse your Mod Media™ cartridges without even removing them! The Mod Media™’s filter is specially designed to handle 15 times more dirt than an equivalent sand or cartridge filter. It can handle so much dirt and continue to operate efficiently, that you will only have to rinse the cartridges once or twice per season. Plus, Mod Media™ cartridges last for many seasons, eliminating the hassle of replacing sand every other year. Driven by our powerful and efficient Sta-Rite® pumps, the system produces optimal turnover rates. In fact, the system is so efficient you can run it less, saving you money on energy costs. The system comes complete with pump, filter, base, and hose connections. Invest in the premium Mod Media™ system this season for unsurpassed water quality and low, low maintenance. Compact Design - Fits easily in tight installations. Sleek-looking in matte black finish. Easy Access - The Posi-Lok™ locking ring is easy to use. Split-tank design permits rinse-in-place cleaning. Superior Dirt Loading - Flow-balanced tank hydraulics direct water through each side of filter module. Uniform dirt-loading prevents clogging.